This file calculates a whole bunch of useful stuff using two-port S-parameters that you can get from manufacturers or measurements. It also presents the data in preassigned plots. Start by copying your nine column S-parameters data in the "Enter data" spreadsheet. Be sure that S21 is in Column D and E, and S12 is in column F and G, the spreadsheet assumes this. Be sure to copy file headers and other identifying information in the space provided, so you don't forget what you are looking at! There are three pull down boxes you need to verify and change as necessary. One tells the spreadsheet if the data is in magnitude or dB format. The next one tells the spreadsheet what units the frequency is in (GHz, MHz, kHz or Hz). Last time we checked these boxes were located somewhere around A24 in the Enter data sheet. A separate box indicates the characteristic impedance reference for your data, which is usually 50 or 75 ohms; this is used only for plotting input and output impedances. Now all you need to do is pretty up the plots (adjust the axes, add info to the titles, etc.) All the plots will use any set of data up to 501 points. If you have more than 501 frequencies measured, your shorts are too tight! There are a lot of columns to the right with intermediate calculations, leave them alone. It isn't easy doing complex math without the Excel "analysis woolpack", but we want this spreadsheet to work for any copy of Excel, so we did the vector algebra by hand. Click here to go to our page on mismatch loss, loss factor etc. Using manufacturers' S-parameters, you can make all manner of useful plots, which will help you evaluate candidate parts, as well as the give you some insight into how accurate the data really is. The file is called "S-Parameter_Utilites_101.xls", and its latest version is located in our download area. Go get it, behold its sheer awesomeness, and use this page as your guide to working its magic! 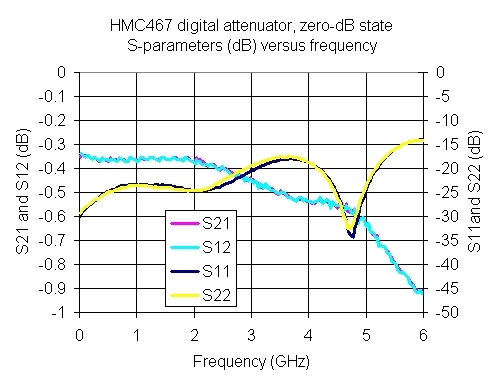 We updated our S-parameter file examples using new data downloaded from Hittite's web site for the HMC467LP3 switchable attenuator in its 0 dB state (thanks Mike V. for pointing out the new data!) If you visited this Microwaves101 page before, you'll remember that the original data on this switchable attenuator had two flaws, first, that the S12 measurement was flakey, and second, the part did not work down to DC as advertised (our guess is that they measured it in a fixture that had blocking caps). Looks like they corrected both problems, so we redid the analysis. Both are included here. You'd think by now they might open the Hittite wallet and sponsor this page! Eleven plots are available in the latest version of the spreadsheet. If you have any suggestions to make the analysis more versatile, send us an email! Below we give you some things to consider when you use our S-parameter utility spreadsheet to evaluate manufacturer's S-parameters. For more info, see our pages on basic network theory and K-factor. For passive reciprocal parts, S12 must equal S21. Example of passive non-reciprocal parts are circulators and isolators. 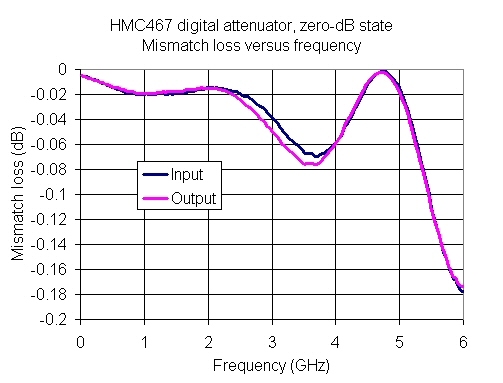 In the intended band of operation, mismatch loss should be just a few tenths of a dB for a passive part, maybe a little higher (0.5 dB) for an amplifier. 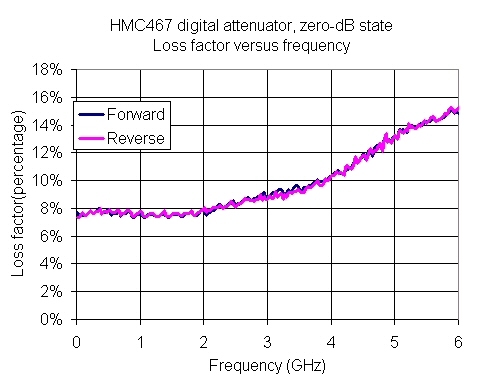 For a passive part, K-factor cannot be less than 1.0, by definition. 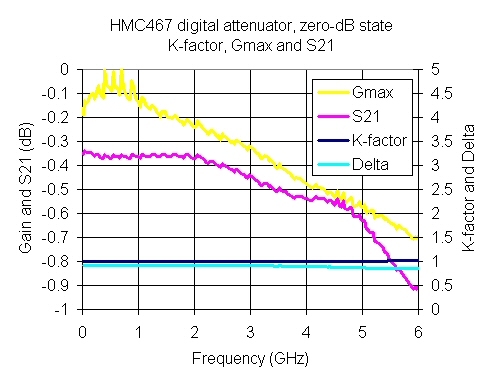 For an amplifier, the K-factor should be greater than 1 at all frequencies, by design, even outside of the band, or you'll have stability problems using the part. Every once in a while you'll find data that is not in this order, it's your job to modify it to match the format above! To use our spreadsheet utility, you first need to insert the S-parameter data into the utilities Excel spreadsheet. If you are copying the data from a text file or a text datasheet, it is probably safer to copy and paste your data into a separate spreadshett and then manipulate the data to fit our 9 column format. It may be that when you paste the data all the data in a row will show up in a single (first column) in which case you can use the "text to columns: feature in Excel, using the "delimited" option, with "spaces" as the delimiter. When your data is in the proper row-column format, then copy and paste the nine columns of data from your intermediate spreadsheet into our utility spreadsheet into the "Enter_data" portion of the sheet, starting in the first frequency box. That was easy! Save it with a file name that indicates the data that you entered. You'll need to do three more things before you even look at the plots. There are two pull down boxes, one says whether you are in dB or magnitude or real/imaginary format, and one tells the spreadsheet what the frequency units are, make sure you have these correct. 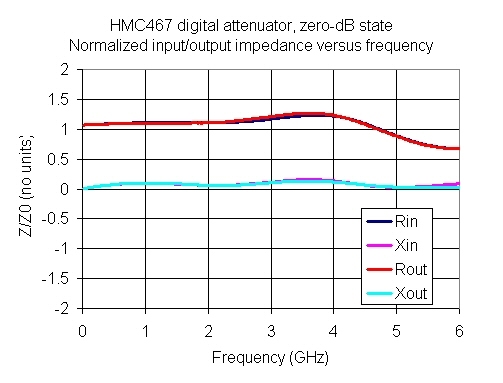 You also need to specify the system characteristic impedance (almost always 50 ohms, but once in a while it will be 75 ohms). You should copy some of the header info onto the "Enter_data" sheet on the blank rows near the top of the sheet so you will remember what data you were looking at, then save it under a new filename. Now all you need to do is go to the plots, and adjust the axes and/or make other formatting changes to pretty them up, and add as much detail to the titles as you want. Voila! 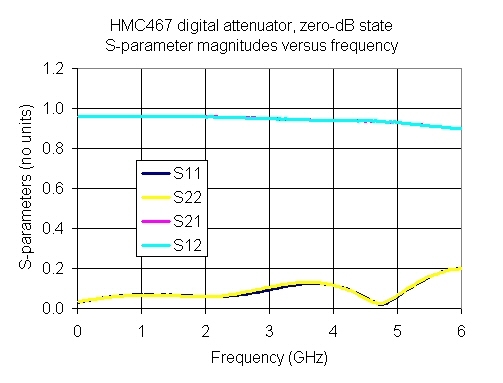 This is what the S-parameter magnitude looks like if it is not converted to decibels. Boring! Because this is a passive reciprocal circuit, the magnitude of S21 and S12 should be exactly the same. 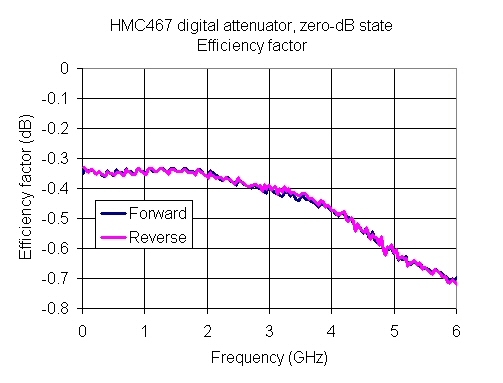 Here's the original data on the HMC467LP, which we pointed out was problematic. 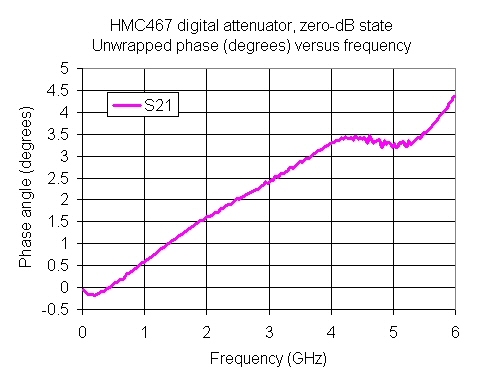 The S12 data has some ugly ripples, and the magnitudes of S12 and S21 go to zero at 0 GHz, indicating that the part doesn't work at DC as advertised. If you ever measure a passive reciprocal 2-port device where S12 and S21 aren't equal in magnitude, you've messed up the measurement and need to start again. Now then, here's the new data. The data is looking good, and passes our passive reciprocal sniff test (S21=S12)! From here down we discarded the old data. One thing we'd like to pass on, if you ever try to put Excel plots onto a web site, you'll need to create jpg or other images of them. One thing you DON'T want to do is to scale an image of an Excel plot (we know this from experience) because the text and lines will soon become unreadable. Here's what we recommend in order to obtain a crisp five-inch wide image. 4. Select all of the text and change it to 12 pitch. Here are the S-parameters, in decibels. In our spreadsheet we put S21 on the primary Y-axis and S12, S11 and S22 on the secondary Y-axis. 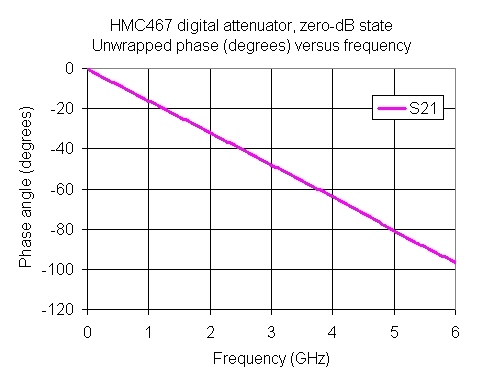 This is helpful for an amplifier, but in the case of this passive device, we suggest that you move S12 onto the same axis as S21 as we did here. In order to convert S-parameters to impedances, you must specify Z0. Usually it's 50 ohms, sometimes 75 ohms. He sure like brackets! 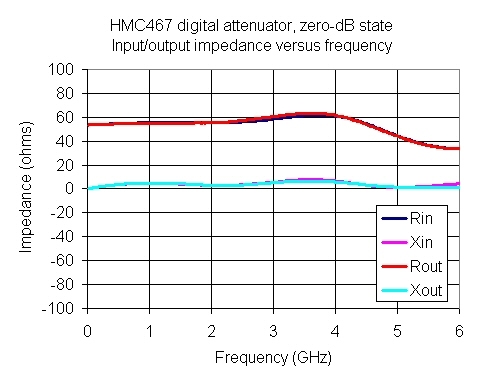 Here's the input and output impedance, with real and imaginary parts plotted separately. Ideally the real part is 50 ohms, and the imaginary is zero. This is just the above plot, with the impedances normalized to Z0. Here we've converted S11 and S22 to VSWR. The part is well matched, under 1.5:1 over the entire DC to 6 GHz band. 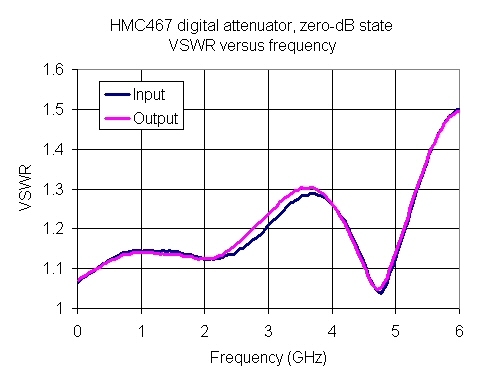 Again, input and output VSWR should be equal for a symmetric passive reciprocal part, here they're slightly different, but no measurement is perfect, and measurement errors are magnified when you look at them in terms of voltage standing waves. Here Click here to learn more about VSWR. Hey, this part is pretty-well matched! You lose less than 0.2 dB due to reflection. The concept of loss factor is discussed on this page. This is a measurement of how much energy is either radiated or is dissipated in heat, due to resistive or dielectric losses. In this case, no more than 15 percent of the input power is "wasted". The loss factor should be equal in forward and reverse directions for a passive reciprocal part such as this. Efficiency factor is also discussed further here. This measurement answers the question, "if I could perfectly match this part, how much loss would it have?" Group delay is a measurement of how long it takes sinusoidal, pulsed or wavepackets to go through the part. 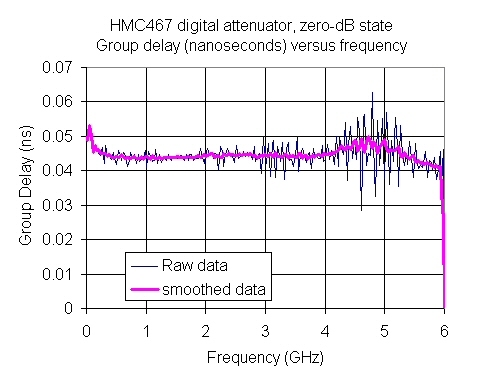 The bumpiness of the raw data (blue trace) is in our opinion because the data points are too close together for the angle measurement to be accurately resolved between frequency points. They might have improved this by applying more averaging to the measurement to reduce noise. At least the bumpiness tells us that they didn't smooth the S-parameter data. For more complicated time-domain wavepackets (sucha as a pulse) a large variation (dispersion) on the group delay across the signal bandwidth will impact the shape of the wavepacket introducing distortion which can reduce signal integrity. This is especially important for communication circuits and ultra wide band (UWB) systems. You'd get a more realistic look at group delay if you smoothed the group delay. Which is something you can actually do using our spreadsheet! In the purple trace below we've added an "aperture" of five frequency points along the curve to smooth the data. From this trace we approximate the group delay at 0.045 nanoseconds, at least at the band center. long or about 1.4 centimeters. Now let's move the reference planes 0.7 cm into device on both sides (1.4 cm total, see group delay calculation above). The phase is much flatter over frequency. It's no coincidence that moving reference planes 0.7 cm on each side (1.4 cm total) to achieve a nearly flat phase, we've made the part have a near-zero electrical length. Because this part is purely passive, its K-factor should be greater than 1 by definition (unconditionally stable). 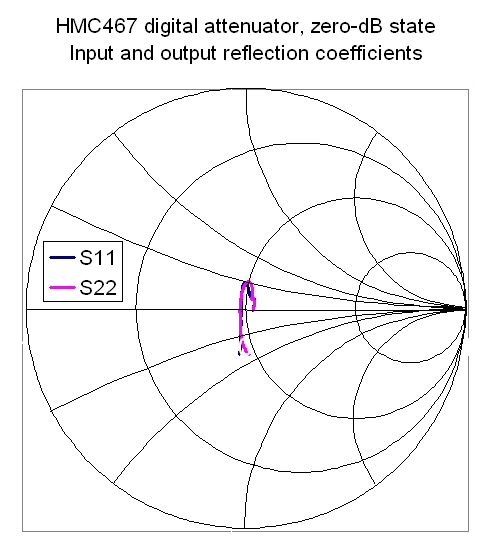 A recent addition to the spreadsheet is the ability to make Smith chart plots of the input and output reflection coefficients. 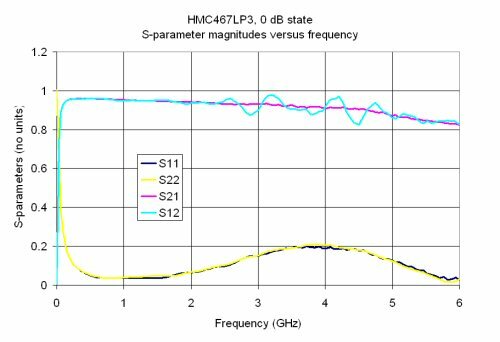 Does the Hittite HMC467 data pass the sniff tests? Indeed it does for the remeasured data!